The app’s creative director, CJ Miyake, told us that the trick was to make an engaging app for all kids. When kids launch the app for the first time, they’re given a set of animations and pictures that they can choose from. This is the preference assessment, and it helps kids buy in to the process of being rewarded. Then, they’re presented with specifically targeted lessons to help them focus in on one skill or topic at a time. If a child gets an answer wrong, they’re not just told it’s wrong. The app actually starts making things easier so that they can get it right, and then slowly removes the extra help over time. Parents and teachers can track their children’s progress via the built-in system, which itself links to the industry standard SKILLS database of things kids with autism need to know to be successful in school and life. That way, treatment teams can use the iPad app to help guide actual ABA therapy in a clinical setting. That’s huge, but there are still a large number of kids who don’t yet have these kinds of direct intervention services. Camp Discovery might be a way to get these kids something while they are still waiting for live interventions. Camp Discovery isn’t a replacement for actual therapeutic intervention, though, cautions Dixon. In the end, having an app with research-based techniques out there can only help. The team plans to add a new lesson to the app every week, which will end up having a large amount of autism-focused curricular content. 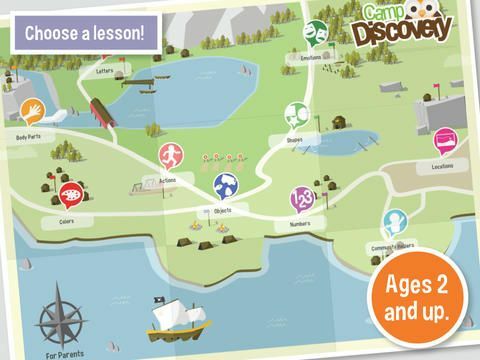 Camp Discovery is available for free in the App Store now.